CableMod has unveiled its Basic Cable Extension Kits, which are designed to bring a bit more style to the inside of your PC. The exciting thing about these kits for case modders: these are universally compatible kits that will work with any power supply, and include the most common cables, namely a 24-pin ATX, a 4+4 pin EPS, and two PCIe extensions. Each of the kits also comes with eight CableMod Cable Combs to help you keep things tidy. There are two series of extension kits, based on which type of graphics card port configuration you need. The 6+6 Pin Series comes with a 30cm 24 pin ATX extension cable, a 45cm 4+4 pin EPS extension, and two 45cm 6-pin PCIe extensions. The 8+6 Pin Series is the same, but has an 8-pin and a 6-pin PCIe extension instead of the two 6-pins. As for color options, you've got black, red, blue, green, orange and white. Or, you can go for a combo color with black plus any of the aforementioned colors (as well as yellow). 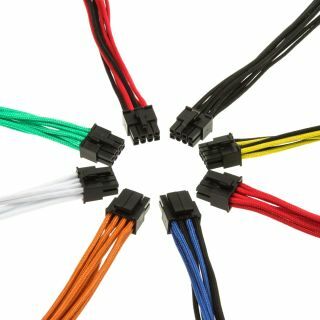 CableMod is also offering a selection of SATA cables with the same solid colors available. Since these cables are universal, you'll be able to move them from one custom rig to another without worrying about the differences between power supplies. The only downside is that, since they're extensions, you're going to have a whole lot of power cables crammed into your case. It might take some clever cable management (or a case with a shielded-off PSU compartment) to make things look pretty. The cables are already available on CableMod's EU Store.